There is a section of the audiophile community who is gradually turning towards home cinema and five-channel sound. However this move often includes several compromises on the stereo sound or requires even two different systems. 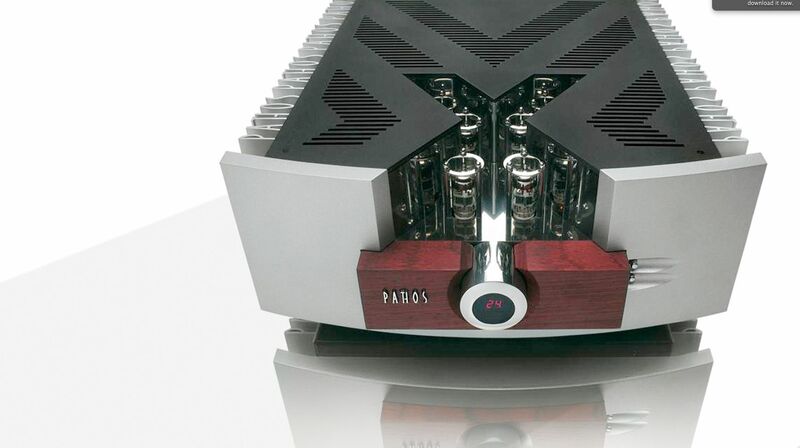 With their new integrated amplifier, Pathos dares to prove that it is possible to integrate high performance stereo and surround sound in one product. Music lovers now have the possibility of watching movies using one only amplifier without sonic compromise. Equally those buying the Cinema-X just for listening to music will not be disappointed either! When operating it as a stereo amplifier, Cinema-X delivers an awesome 450 watts per channel into 8 ohm. In 5.1 mode it delivers 5 x 110 watts into 8 Ohm with a very wide bandwidth, making it ideal for high resolution media. The electronics network has been laid-out according to the approved Pathos’ kind: tubes for amplifying voltage and mosfets for amplifying current. This creates the best synergy between the traditional approaches of designing amplifiers. The valve preamp stage operates in class A and uses 6 tubes, one for each amplifier channel and one for the sub-woofer output. Each channel can be individually adjusted via the remote control. The power section employs mosfets and all five boards are identical, in order to ensure equal sound quality and power in all channels. The high power rate is due to the intelligent layout; in stereo-mode it automatically turns off the centre channel and turns the remaining amplifiers into a completely balanced layout. All these technical initiatives ensure superior sound. There is ambience, warmth and realism from the tube stage combined with astonishing control and pace from the power stage. The result is an articulate, yet open and dynamic sound. Although using advanced initiatives, Cinema-X is a joy to use and very user-friendly. Connect a DVD player with a built-in decoder or an external decoder, to the 5.1 inputs and you expose the world-renowned Pathos sound in five channels. Or use one of the XLR or RCA stereo inputs for two-channel sound (2x450Watt). Cinema-X is a stunning performer five channels without making any sacrifices to purist two-channel sound.